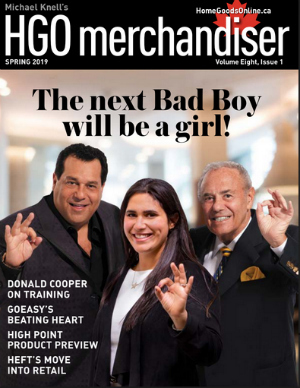 BRIGHTON, Ontario – The Spring 2019 edition of the HGO Merchandiser, which is now read to download and read, turns its spotlight on Samantha Lastman, the newest member of our Next Generation club who’s making her mark as director of business development for Lastman’s Bad Boy, the high-impact promoter originally founded by her grandfather back in the 1950s. This prompted us to proclaim that The Next Bad Boy will be a Girl! Ashley Newport, HGO contributing editor, researched and wrote our profile of Samantha Lastman who said growing up in a famous family – her grandfather Mel was the long-time mayor of the City of Toronto and her father Blayne made quite a stir in his chain’s early years – had its challenges but it actually felt normal. She’s one of our industry’s next generation of leaders. The High Point Market is the largest furniture trade show in the world, spread over 180 building and some 11 million square feet of display space. In addition to some 80-plus Canadian resources, most of its exhibitors are interested in do business with retailers from this country. In this issue, we present a snapshot of the product offered to those buyers and designers who attended the spring edition, which ended its five-day run in early April. It doesn’t get a lot of public attention, but Easyhome remains an integral part of GoEasy’s overall business. After years of losing ground, the lease-to-own merchant stabilised in 2018 and even reported a minor uptick in sales at the end of the year. Growth in the coming years won’t be record breaking, but its senior management has every confidence in its ability to perform. In fashioning our report, HGO publisher and editor Michael Knell spoke with Steven Poole, GoEasy senior vice president of operations and merchandising. We also celebrate the opening of the Ashley HomeStore in Belleville, Ontario. It’s the second Ashley HomeStore opened in eastern Ontario by the Upadhyay family, the owners of HEFT, a decorative accessory resource supplying both retailers and designers. Greg Simpson got to know the family and filed this story. Donald Cooper, our resident retail guru, firmly believes training is critical. The retail market is changing faster than ever and keeping up with them in real time means having a dedication to learning whether it’s product knowledge, business knowledge, healthy and safety knowledge or any other retail-related topic. In his essay, The Many Faces of Training, he points out that smart business owners ignore it at their own peril. 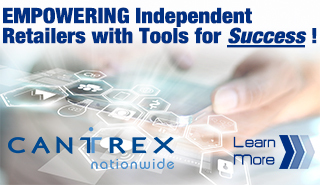 Click here to download your copy of Spring 2019 edition of the Merchandiser.